Aerial lift platforms are great tools to conduct work at heights and increase production efficiency. These machines lift personnel, tools and materials, from 10-12 feet in the air to as high as 100 feet. Successful completion of this course will result in familiarization with various types of aerial lifts, increased knowledge of how to set up and safely operate them, and recognition and avoidance of the most common hazards associated with their use. 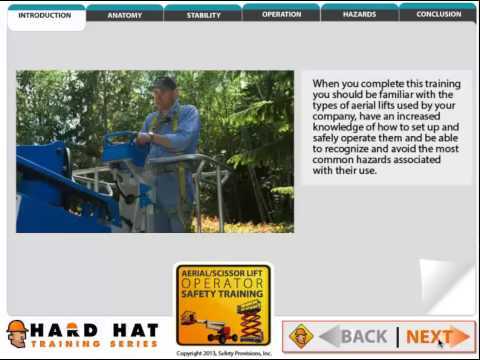 AERIAL LIFTS AND SCISSOR LIFTS ONLINE TEST: Testing conducted throughout this online Aerial Lifts and Scissor Lifts course is designed to reinforce the information presented. A mark of 80% must be achieved in order to receive a certificate of completion. Participants are able to repeat the course twice if the pass mark is not achieved on the first attempt. AERIAL LIFTS AND SCISSOR LIFTS CERTIFICATE OF COMPLETION: Upon completion of this online course, a certificate of completion will be available for download and printing.